In the aftermath of the Erudite’s co-option of the Dauntless and attack on Abnegation, Tris and Four leave the city and try to rally their forces against the Erudite’s brutal campaign. But what can Candor and Amity do against the Erudite’s technology and the Dauntless training? What can the Dauntless do when split against itself and at risk from the Erudite’s mind control? 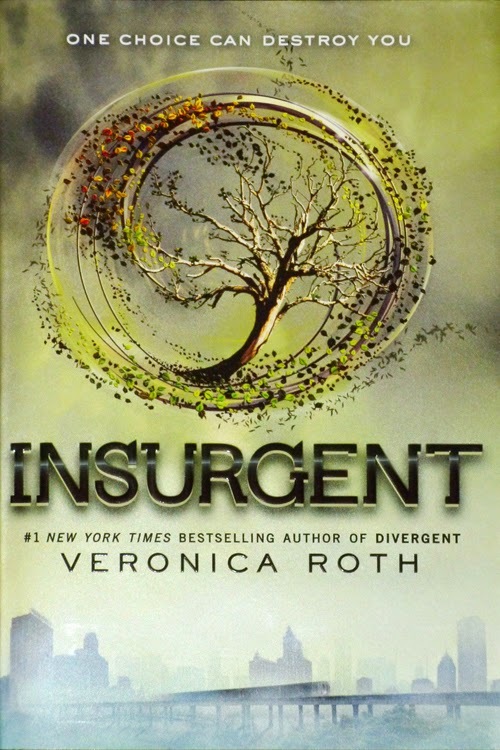 Forces have to be rallied in the most unlikely of places, all the while dealing with the fallout of so much loss – and the terrible things Tris has had to do. And under it all is a creeping worry of what they will do – is it right to destroy the Erudite? Can society survive without them? Can it survive if the Erudite win? How can they win a war that seems to have no good outcomes? In some ways this book continues and confirms my opinion of the world building from Divergent. The faction system is broken, it doesn’t make much sense, it’s not workable, not a useful tool for creating peace let alone one for creating a society that works. That’s not bad world building on the part of the author, that’s what we’re supposed to be seeing – this whole book, even more than Divergent is about showing the flaws of the system, the flaws of each faction and it inevitably breaking down. The factions only last because of constant drugging and a developed knee jerk hatred about every other faction so they constantly support their own without question for fear of being seen as disloyal or “unpatriotic.” Any attempt at thinking clearly and sensibly is clearly Erudite sympathies, any attempt to seek peace is cowardly Amity-ness etc etc. This system designed for peace only lasts because of the created conflict within each faction. Yet this conflict will inevitably lead to the war. This is the underpinning feature of this series – this society is broken and that’s not bad writing, it’s the world itself. I also appreciate that an effort was made to reverse the overwhelming condemnation of the Erudite and a final acknowledgement that their society would collapse without them – that without the technology the Erudite provide then no-one else would be able to live. There are elements I do consider terrible world building – like Candor and Dauntless being pretty much useless society. Candor doesn’t seem to provide any valued service to the other factions (and if they do they needed to emphasise that more – especially since Divergent suggested they were the legal class) and Dauntless exists to protect them without actually any indication of what they’re protecting them from. Instead they’re a lot of weapon toting adrenaline junkies who could pull off a coup at any time because they’re the only faction who can fight. I also have problems with the ending which I’m going to try and not spoil. But I can see why the Divergent, with their mental flexibility, adaptability and even empathy are a way forward for peace. I cannot see how the people-who-made-this-plan-who-will-remain-nameless expected the thing-they-created to be a good vehicle for achieving anything. It’s a little like someone saying “we need Divergent for peace! So we will throw cottage cheese at cats.” I can see the first part, I’m not quite sure what the second part has to do with anything. This doesn’t help that the ending is just plain awful anyway – this is the big secret? This is the secret worth starting a war over? This is what people were willing to die to defend? There’s also the conflict of being Divergent which I think is fairly well done. After all, Tris has aptitudes for 3 different factions – in a world where any deviation is regarded with suspicion at best and the prime way to show loyalty to your faction is to show contempt for the others and their traits. How can she embrace her natural curiosity when she loathes the Erudite so much? Is finding courage through selflessness a betrayal of her Dauntless faction ideals? There’s a fair amount of good there. And then there’s the bad – Four. Not that Four is inherently a bad character per se, but Four and Tris’s romance is annoying, contrived, takes up a vast amount of space and is completely and utterly unnecessary to this book. We have a story here. We have a story in an interesting world with lots of epic battling against a broken society with lots of character growth and personal conflict. And all of it takes a back seat because of Four and Tris’s romance which we seem to spend a vast amount of really pointless time on – and it adds nothing to the story. Worse, it has a bad case of “second book romance” – you know when the first book is all “will they won’t they” (or, more likely, “when will they?”) and then it ends with them together? Well then you have a second book and you need to continue this story so – RANDOM CONFLICT HAPPENS. I see this in so many books with a heavy romance plot, they get together in the first book and then contrived reasons drive them apart in the second book so there can still be some convoluted conflict in the story. Tris and Four spend most of this book mad at each other, reconciling, falling out, arguing, pouting, keeping secrets, being sulky about those secrets, throwing around double standards like they’re going out of fashion and generally making me want to give them both a good slapping with fresh haddock. Half the time I didn’t even know why Tris was mad at Four and I really didn’t care. On to the inclusion. We do have a large number of background POC in every faction. Every time there is a groups of POC of any group around, some of them will be expressly described as POC. Of the main characters, Christina is a Black woman and she’s somewhat involved… but it’s only really somewhat. The flip side is I’m not sure how involved anyone beyond Tris and Four – I can’t say there’s anyone else in the book who stands out as more involved than Christina. There are a mind numbingly huge number of names though so I could be thinking 1 random person are 2 different random people. One character is revealed as loving another woman (who is already dead) seconds before she dies. Don’t even try to sell me this as inclusion: “Oh I loved Dead Girl, not as a friend because I’m a les…COUGH SPLUTTER DEATH” is not inclusion.